Add flour, sugar, vanilla sugar, and baking soda to a bowl and stir to combine. Add eggs, melted butter, sour cream, cream, and milk and whisk until a smooth batter forms. Preheat waffle iron and grease with some oil. Ladle in some batter and set a popsicle stick on one edge of the waffle, then top with a little more batter to cover it. Close waffle iron and bake until the waffles are golden brown. Remove from waffle iron and let cool. Repeat with the remaining batter until it’s all used up. 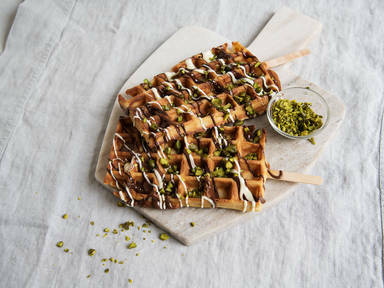 Drizzle a mixture of the melted chocolate over baked waffles and sprinkle with chopped pistachios. Enjoy!